Cara has spoiled me! 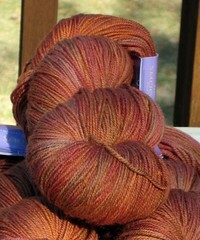 She sent me my absolute favorite colorway of Dream in Color yarn. Cara had heard me mention that I had fallen in love with this yarn when Kathleen had shown it to me and as luck would have it Knitty came out with the perfect pattern – Jeanie! thank you Cara – you’re the best! Kris (and Dana!) at Sonny and Shear have a great online shop and do a lovely job of packing and shipping. It arrived promptly and was wrapped with bows and some fancy tea thrown in as well! what could be better?! On the personal knitting front I am making good headway on the secret Cara’s baby project. I attempted to torture her a bit with the sound of my row counter – when we were on the phone I told her I was knitting a surprise for the bambino and held the ka-kching up to the phone. “You’re COUNTING ROWS??! !” she screamed. I am a row counter but don’t usually count them as I go, I count them once I get to a certain point. In other news, D#1 called this weekend to inform me and Boar that she had her nose pierced. Don’t you just love these kids? I actually don’t object, I would get my own pierced if I thought I had a good nose for it (I think they need to be pointier than mine). Anyway that did provide a bit of excitement since Boar does not share my opinion. oh well, times they are a changin’! Be still my heart. That yarn is gorgeous! I was 19 and at college when I got a tattoo. I called my parents to tell them and asked to speak to both of them at the same time. They were so terrified of what I could possibly be about to say, they were practically relieved when I told them about the tat. I have a story similar to Jean’s–when I got my tattoo at 18 years old, my mother was very concerned (read: in tears) when I told her I had something I couldn’t get rid of…she was relieved that it was nothing worse than a tattoo! (she was a bit ticked off that I had gotten her so upset at the get-go). Anyway, lovely yarn! Jeanie is in my queue too. Beautiful yarn and I love that pattern. It’s in my queue also. It’s true. I am fantastic. I am knitting a pair of socks for Dale right now in Dream in Color and I LOVE LOVE LOVE this yarn. It’s smooshy, just like the name says, and it’s really wonderful. Enjoy yours! Makes me wonder what kids will come up with when my boys are a little older. That would cause a war in my house. ~snort~ I’d win anyway, so no big deal. It looks cute! Nice score, makes getting another year older well worth it. Love the color of the wool. My eldest son did the same thing at that age, except it was his tongue. 6 months later he got rid of it. At least the body piercing is not permanent. I immediately saw a big old hoop in her nose; this is MUCH better! My two are dying to get their noses pierced, but the employer of the youngest says no to facial piercing. Personally, I am fine with a tiny stud, but I will draw the line there. I have a student who self pierce his lower lip, was very proud of it, and was shocked when I said his mother would flip when she saw it. “But she has face piercings,” was his reply. He came in today with his head shaved since his mother found out about the lip ring, flipped out, and took him to the barber’s to get his hair shaved. Love the yarn by the way . . . might have to check this company out. was fun today…still reveling in the glory of my panini making skills. thanks for the panini support. Oh, I dream of Jeanie… Wow!! That color is GOR-geous! I always wanted my nose pierced, too. Funny… Ali’s had a number of piercings, none of which “lasted” long because they drove her nuts, but never the nose and I’ll bet that one wouldn’t have bothered her much. I love Dream in Colors yarn. Is that November Muse or Chinatown Apple? I want to get enough of Classy to knit a couple of sweaters. Belated ‘Happy Birthday’ to you. I seem to be running behind on everything lately. Pretty, pretty yarn. Saintly, generous Cara. Lucky, lucky Ann. my child (cause she was 16 at the time) called us from Israel to tell us that she got her belly button pierced. I think the whole world heard us get upset about that one – now that she’s 18, nothing I can do, but at 16……..
ooooh! Did it hurt? She can’t go wrong that one! She Looks so hip, so beautiful but ooooh I am getting the willies! the nose piercing will become a real pain when she has to take it out to blow her nose- at least that is what someone i know had to do with her nose piercing. wonder what your mom would have thought about that? That yarn is GORGEOUS! My son now has a tattoo. A big tattoo. It says MADE IN KOREA and has the South Korean flag in it. It stretches from one shoulder to the other across his back. Why this tattoo?? He was made in Korea — we adopted him and his brother in 1988. I told him he needed to add RAISED IN THE USA. Kids – raising them is like trying to nail Jello to a tree!